Disclosure: I received 2 balls of Sudsy Dough for review. All opinions are my own. Kids can squeeze and squish Sudsy Dough in the bath, rub it on as a cleansing body wash, or take it outside the tub and make their own custom-shaped soaps. Sudsy dough shapes will dry to become mini bars of scented soap. Shape the dough into anything you can think up! Kids will love playing with this squishable, sensory soap in the bath. Each ball of Sudsy Dough also has a surprise squirt toy hidden inside! Kenzie had a blast and immediately found the hidden surprise and squealed in glee. She was excited about bringing the "dough" into the bath and said that it smelled good - "like coconut". Mason just dug into the container of Sudsy Dough to find the hidden treasure as well. Infused with Shea butter and coconut oil, Sudsy Dough moisturizes as it cleanses. It also comes in a variety of fragrances and colors! Sudsy Dough has a mild foaming agent that creates suds when run under water. Hubs was surprised at how well the dough lathered to wash the kids. He even cleaned the bath mat with it right after I pulled them out! After your kids play with the Sudsy Dough in the bath, you can place it right back into the container to let "dry" so that it can be played with outside of the bath. 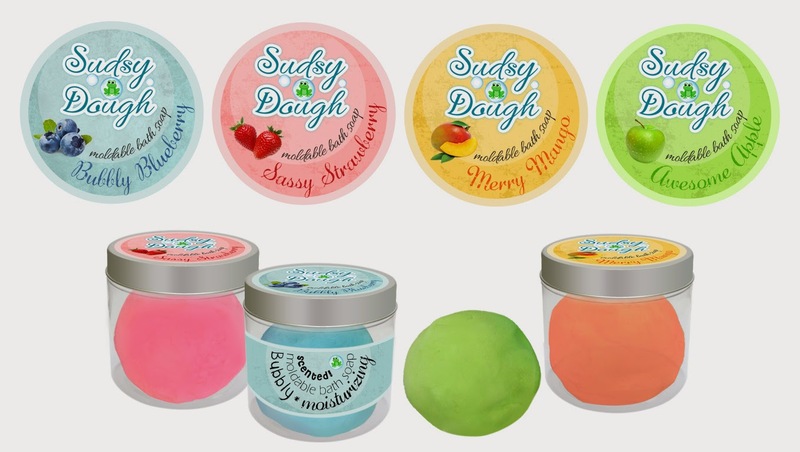 The Sudsy Dough is so much fun plus it comes in pretty colors! Check out the Kickstarter campaign and support to get your own! I love the pretty colors it comes in. How fun! Well this is sure to make bath time more fun and exciting, love that it is Paraben-free, phthalate-free, and sulfate-free. Huge plus!